While walking Vegas through my neighborhood recently, my boyfriend said that our poor pooch got spooked when they passed a house particularly enthusiastic about Halloween this year. Complete with giant inflatables, a "graveyard" and plenty of orange and black, apparently this house made Vegas hang her head and attempt to slink to the other side of the street. This little scenario made me realize that whether we like it or not, Halloween is coming at us with an intensity that begins earlier and earlier each year. Much like department stores decorating for Christmas in October, many families are now decorating for Halloween in September. And this means that on October 31, the parties, celebrations and extravaganzas will take place with an overwhelming severity. 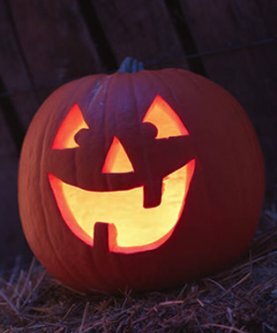 Which also means that, for the average homeowner, the likelihood that something Halloween-related will get smooshed into his or her carpet has increased exponentially. Carpetology Blog to the rescue! Below are a few Halloween-y items that could potentially create spooktacular stains on your carpet. We've included the best ways to prevent those stains from remaining with you all year, and links to more information. Candy - Be it Swedish Fish, Skittles or Laffy Taffy, having sugary, brightly colored candy stuck in your carpet can be a bit of a problem. When the stain is removed, rinse with clean, cold water and blot. WearDated.com suggests making a pad of white paper towels and placing it on the spot, weighing down with a brick until dry. Makeup - When you're a kid, makeup brings every costume that much closer to reality. Except when the make-up winds up on the floor instead of your face. But if that happens, all is not lost. Simply scrape up the extra using a dull knife (or vacuum, if it's a solid), then use a white cloth to blot the stain with isopropyl rubbing alcohol (the CRI suggests using a detergent solution). If the spot extends deep into the pile, blot until it is removed or no color transfers to the cloth. However, if the spot is on the surface only, rub the stain in one direction at a time - never use a circular motion because it could harm the carpet's texture. When the stain is removed, rinse with cold water, then blot (the brick trick mentioned above works at this point too). A major watch-out with alcohol, though: Do not allow the alcohol to penetrate the backing, as it will destroy the latex bond. Annette says "it is important to know this because otherwise you will end up with tufts coming out of the carpet!" Chocolate -Kit Kats, Snickers, Hershey bars... delicious to your tastebuds, but deadly to your carpet. To remove the remnants of a chocolate casualty, get rid of as much as you can using a spoon, then blot, blot, blot. Wear-Dated suggests neutralizing the stain with an ammonia solution [it consists of a household ammonia solution of 1 tablespoon of clear household ammonia per 1/2 cup of water], then blotting it with a detergent solution and a white cloth. Rinse, blot and weigh down with towels and a brick. Keep in mind that with all of these stain solutions, time and patience are both required. You may need to rinse and repeat a few times before the stain leaves your carpet completely. And don't forget that you can look up the solutions to these and many other stains using the Stain Removal Guide at WearDated.com and the Spot Solver on the CRI's Web site. Act Quickly! Delaying may cause the spill to become a permanent stain. Many spot removal solutions leave residues in the carpet that may attract soil. Thoroughly rinse the area several times with lukewarm tap water. Blot with paper towels and pat dry after each rinse. Several rinses are often necessary to thoroughly remove residues. More tips can be found here, at the Carpet & Rug Institute's Web site. Good luck, and of course, have a happy Halloween!